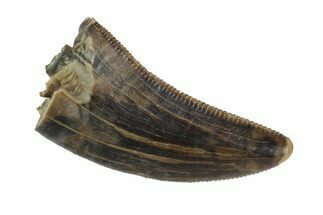 We have authentic tyrannosaur teeth for sale from several different locations in the US. 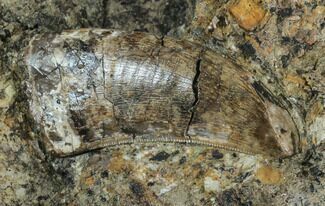 There are two tyrannosaurs described from the Hell Creek Formation Nanotyrannus and Tyrannosaurus rex (T-Rex). Many contemporary paleontologists believe that they are a single species, with Nanotyrannus representing a juvenile T-Rex but this is still a hotly debated topic. 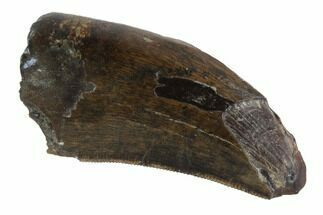 There are people that claim the Nanotyrannus are more laterally compress than T-Rex teeth but you would also see different tooth shapes depending on the placement of the tooth in the jaw. 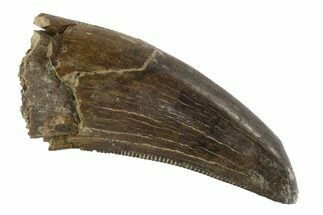 We also often have teeth for other older Tyrannosaurs such as Gorgosaurus and Daspletosaurus. Tyrannosaurus rex was one of the largest theropod dinosaurus. It's estimated to have reached 40 feet in length and weighed around 7 tons. 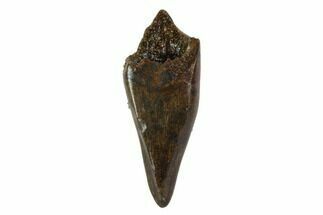 Tyrannosaurus teeth could reach lengths of about a foot long when including the root which typically is about 2/3 of a tooth. 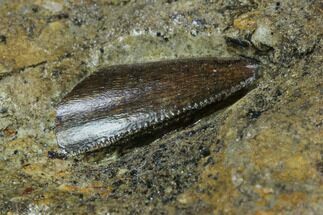 Good quality teeth over 3 inches are typically pretty rare, and command steep prices due to their collect-ability. The largest T-Rex ever found is name Sue and has a skull nearly 5 feet in length. It's estimated that it could have consumed nearly 500 lbs of flesh in a single bit. 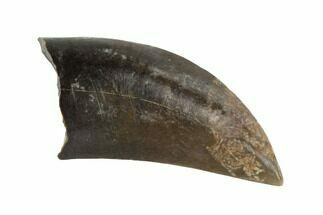 Tyrannosaurus rex was among the last of the non-avian dinosaurs to exist prior to the Cretaceous-Paleogene extinction event approximately 65 million years ago.